For the June monthly meeting, come hear the fascinating story of a woman who overcomes her fears to go ocean sailing. The meeting is at 7 pm, Tuesday, June 11, at the Caddy Shack @ Rolling Hills, 1415 North Mill Avenue, Tempe. Visitors are welcome. Camille Gannon wrote a book about her exploits and the blurb of the book begins this way: Camille Gannon cannot swim. In fact, she suffers from a gut-wrenching fear of drowning. 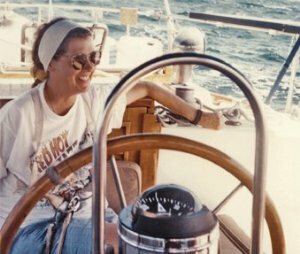 At the peak of her professional career, her husband, Peter, reveals his lifelong dream of circumnavigating the world on a sailboat, with Camille as first mate. So begins a nearly two-year saga where Camille must suppress her fears and dreams and find the will to accept a life of isolation and her own inadequacies as a sailor. Living within the confines of a 44-foot sailboat, experiencing the awesome power of nature on the open sea, and enduring the intrusion of crew members along the way, she struggles to support Peter as they island-hop across the South Pacific. While landfalls and shore leaves are fascinating adventures, cruising is not all blue lagoons, sunsets, and tailwinds. Yet Camille’s anxiety slowly evolves into confidence in her abilities as a sailor, a wife, and a woman. The book is called Woman Overboard and she promises it will resonate with all women faced with the choice of enabling the passion of a beloved mate when doing so means personal sacrifice and confrontation with their fears. The memoir is a warm-hearted glimpse into the life of a cruising couple as they discover the true meaning of bon voyage.